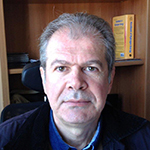 Dr. Athanasios Stubos is Director of the Institute of Nuclear & Radiological Science & Technology, Energy & Safety at the National Research Center Demokritos, Greece. He earned his Ph.D. (1990) and his M.Sc. from the von Karman Institute for Fluid Dynamics in Belgium, and his Chemical Engineering Diploma from the National Technical University of Athens. He has more than 150 publications in international refereed journals and more than 185 presentations in international conferences. His research interests include environmental fluid mechanics, materials for energy and environmental applications, energy storage, hydrogen technologies, porous media. He has coordinated various European R&D projects, and participated in industrial R&D undertakings in USA and Belgium. The energy related activities at NCSR “Demokritos” referring to nuclear (fission and fusion), renewable (solar), alternative fuels (hydrogen) as well as the environmental impact of energy processes will be briefly presented.